There aren’t many things that make my blood boil, but any kind of prejudice or stereotype will. Especially when it’s indirectly targeted at me. I have been absent from my posting for a little bit due to the crazy busy (but wonderful) holidays and wrapping up my baccalaureate degree in Public Health with a focus of Education and Promotion. But I need to say something important right now. First of all, self-inflicted or not, you still treat a patient. If you were a doctor and someone came into your emergency room after trying to commit suicide, would you save them? Of course you would. I understand the limited number of livers available makes this a little bit more of an ethical question, and I will digress for a moment to say UNOS (United Network for Organ Sharing) and transplant centers have extremely stringent rules for listing an alcoholic for a transplant. If you are an alcoholic and need a liver, you wouldn’t even make the waiting list until they were sure you were sober with a low chance of returning to old ways. It is very hurtful when someone holds a prejudice towards you or one of your kind – your race, your health status, your financial situation, whatever it may be. Our instructor in this course has specifically asked to know about anything being said by our peers that is “uncomfortable” to us, so I wrote her an email to say I was more than uncomfortable. I am just posting this so that all of you know that people dying of liver failure waiting on organs are not a bunch of alcoholics. The majority (90%) of us have, or had, diseases that we in no way, shape, or form, have/had given to ourselves. I’m extremely uncomfortable with [my peer’s] reply to my paper topic idea, health disparities affecting access to liver transplants. He ended his post by saying, “I personally don’t agree there is a large enough disparity, only because many of these people’s conditions are self inflicted,” referring to drug and alcohol abuse. This is a huge myth. I became sick with an autoimmune liver disease at age 5. I was not an alcoholic; my body simply attacked itself. I’ve done research on indications of liver transplantation, and alcoholism/drug abuse account for an extremely relatively small proportion of all transplants. When I was a teenager (before my transplant in 2010 at age 23), I had an emergency room nurse flippantly say, “Why do you have liver disease? You must have been an alcoholic for years!” I was heartbroken as it was the first time if had experienced that prejudice. Not one ounce of alcohol had touched my diseased liver. Ever. Maybe I’m overreacting, but I am hurt by my peer, a student in the advanced stages of a health degree, no less, being condescending toward patients with liver disease. I tried to politely respond and tell him the truth so that he could learn from this experience. I hope we all learn something from this. Preconceived stereotypes are extremely hurtful, and we must be extremely cautious never to have them with our patients/clients. Maybe you don’t believe this myth about liver transplant patients but you think all people with diabetes gave it to themselves by eating junk food, all the people in that neighborhood are drug addicts, or even that another race is just a little less “worthy” than yours. Well, I would like to firmly propose that no one should say anything negative about anyone unless they have done extensive research and know it to be 100% true, 100% of the time. Which pretty much would eliminate any stereotypes because none of them meet those criteria. And if you can somehow outsmart me and find something that meet those criteria, and want to voice your prejudice, don’t. This story from Stanford University School of Medicine is the most personally hopeful account of a medical observation I’ve heard in my lifetime. As a patient who was forced into a liver transplant due to Primary sclerosing cholangitis and having met friends along the way with identical stories, this article ought to inspire a lot of us. There is no cure for our disease – none but transplant itself. But sometimes, by the point a patient is sick enough to get to that point on the list, he or she is too sick for transplant. Not to mention the ease of a transplant compared with the ease of well… read on and see what this physician noticed is “curing” PSC. Even though what this doctor at Stanford has discovered perhaps may not necessarily be a medical breakthrough, or not quite yet at this point, it is to us! To the families this treatment has impacted already, to each patient it’s prevented from transplantation, to each patient whose life it has saved, it most definitely is. To those of you who may be reading with PSC right now, print this out and take it to your doctor to read over. I’m sure Dr. Cox would be very interested to know from your physician how your case ended out. I pray this saves you from a transplant and helps us find a cure so that one day, PSC will only be a term for a disease that used to be. IT WAS THE TYPE OF CASE THAT MAKES DOCTORS FEEL HELPLESS. The 15-year-old boy’s lab tests indicated his liver function was badly impaired. He had a double whammy of two serious gastrointestinal diseases, both lacking cures. On top of it all, his colon was infected with an aggressive bacterial strain, Clostridium difficile. Although pediatric gastroenterologist Kenneth Cox, MD, had little to offer for the teen’s other problems, he could at least treat the infection. He prescribed the antibiotic vancomycin. And something very strange happened. The liver-disease symptoms vanished. So Cox, who is also associate chair of pediatrics and senior associate dean for pediatric and obstetric clinical affairs at the Stanford School of Medicine, gave a second round of vancomycin. Once again, the teenager’s appetite returned, his pain disappeared and his liver tests normalized. Cox tried vancomycin in a handful of other patients who shared the teen’s liver and colon diagnoses but had never had C. difficile. These kids had been told that their liver disease, primary sclerosing cholangitis, was untreatable. Even a liver transplant was not a guaranteed cure — the disease could recur and destroy a new organ. Yet with vancomycin, the PSC disappeared. The discovery left Cox in an unusual position. A coincidence — a serendipitous colon infection, of all things — left him holding a potential silver bullet for a devastating and poorly understood pathology. PSC starts in the “biliary tree,” the tree-shaped network of tubes that carry newly manufactured bile from the liver through the bile duct to the intestine, where bile aids digestion and absorption of dietary fat. In PSC, for reasons no one understands, the tubes become blocked by inflammation. So bile backs up, destroying liver cells and eventually causing cirrhosis. The rare disease, which occurs in about 10 people of every million, leaves patients feeling severely unwell, with abdominal pain, itching, jaundice, poor appetite, deep fatigue and signs of malnourishment. It can hit people of any age. About three-quarters of PSC patients — including the 15-year-old who started Cox’s research odyssey — also have the more-common diagnosis of inflammatory bowel disease, another poorly understood condition, which is characterized by inflammation and ulceration of the intestine, diarrhea, abdominal pain and a host of other problems. Cox and his Stanford collaborators believe that if they can figure out how vancomycin alleviates PSC, they’ll solve two mysteries at once. Not only will they have the evidence to convince other physicians that vancomycin is a good PSC treatment, but by finding out how the drug works, they may also learn how PSC begins — which may open doors to better therapies. Although the research task is daunting, beneath Cox’s caution about its challenges is a definite sense of excitement. One of the most dramatic vancomycin-induced transformations came in 2005, after Cox’s team suggested the drug to Lyn Woodward and Melissa Hartman. Their little girl had been through the diagnostic wringer. Things began to go wrong for Ellery Woodward-Hartman at 8 months of age, when her growth started to lag behind that of her twin brother, Robert. Her liver function gradually worsened; no one could figure out why. By the time she turned 2, Ellery’s liver was scarred with cirrhosis and she was badly jaundiced. Before Cox saw her, other physicians had tested Ellery for everything from cystic fibrosis to lymphoma to HIV. None of those diagnoses fit, and her liver was getting worse. Woodward and Hartman were told to anticipate a liver transplant. “I thought, this can’t be happening,” Hartman says. In late October 2005, Cox’s pediatric gastroenterology fellow, Anca Safta, MD, read Ellery’s chart. The symptoms lined up with PSC, Safta and Cox agreed. Safta proposed vancomycin treatment to the family. “She said, ‘I know about Ellery; we have something that can help her,’” Woodward says, recalling her first conversation with Safta. ‘MOST DISCOVERIES COME BY CAREFUL OBSERVATION. I FEEL LUCKY THAT I’VE MADE THIS OBSERVATION.’Cox wasn’t sure a child as sick as Ellery would benefit from the therapy; his other patients had mostly been at earlier stages of PSC illness. Maybe the antibiotic would at least give her a few months to get stronger before a transplant, he told Woodward and Hartman. Cox wrote the prescription and told the family he would follow up with them soon. Since 1993, Cox has tried vancomycin on every PSC patient he’s treated, slowly accumulating evidence for the drug’s effects. In 2008, he published clinical observations of the first 14 patients, showing the drug caused improvement in blood markers of liver failure. The index patient, now an adult, is no longer in Cox’s care, but last Cox knew, he continued to do well. To date, 33 of Cox’s patients, plus a handful of others cared for by colleagues around the country, have received the drug. But it’s still largely unknown as a PSC therapy. Funding has been one obstacle to advancing the research. So far, the work has proceeded without traditional funding sources such as NIH grants. Instead, patients’ families have financed the research via a parent-launched nonprofit, the Children’s PSC Foundation. Cox is now working to secure pharmaceutical company funding for a multicenter study to enable researchers to try the drug in a larger group of adults and children. 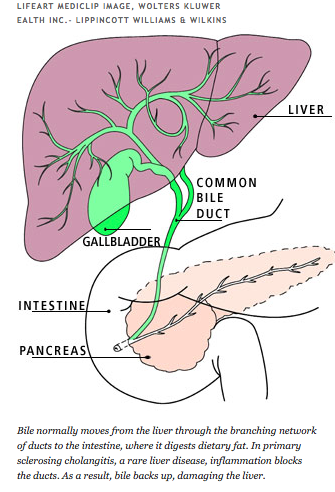 Bile normally moves from the liver through the branching network of ducts to the intestine, where it digests dietary fat. In primary sclerosing cholangitis, a rare liver disease, inflammation blocks the ducts. As a result, bile backs up, damaging the liver. In spite of the limited resources, Cox has assembled a multidisciplinary team of Stanford collaborators to figure out how vancomycin works. The scientists are starting from one important clue: They know oral vancomycin, the drug formulation Cox uses for PSC, is not absorbed from the intestine. Yet PSC’s trail of destruction starts with inflammation outside the intestine, in the tubes that drain bile from the liver to the gut. The drug must be acting at a distance — but how? One hypothesis is that PSC arises when pathogenic bacteria in the gut backflow into the bile duct and start a destructive inflammatory response. Normally, everything moves down the duct in one direction, from liver to intestine. “Essentially, this would be regurgitation of bacteria into the bile drainage system,” says project collaborator David Relman, MD, a professor of infectious diseases and of microbiology and immunology at Stanford. Another possibility is that bacteria somehow escape from the gut to the blood, then travel through the blood to the bile duct and trigger inflammation. Under these hypotheses, which Relman’s laboratory is starting to investigate, vancomycin would resolve PSC with its antibiotic action, killing gut bacteria. To determine if that’s happening, the researchers are first taking a census of the bacterial communities in healthy children’s small intestines. “Almost everything we know so far about the usual gut microbe community is based on adults,” Relman says. The researchers plan to compare gut microbes in healthy kids to those in PSC patients before and after vancomycin. Their major obstacle — indeed, the reason we know so little about kids’ gut microbes — is the difficulty of sampling the small intestine’s contents. It would be unethical to perform invasive endoscopy on children who have no medical indication for the procedure, so the control samples in Relman’s new study will come from kids receiving endoscopy to investigate non-PSC complaints such as chronic abdominal pain. It’s also challenging to find “control” children who have not received recent courses of antibiotics. “That we know messes with the normal picture,” Relman says. Still, he is optimistic about the lab’s prospects for cataloguing the gut microbes of kids with and without PSC. If kids with PSC have “different” bacteria before vancomycin treatment and return to a normal bacterial profile with the drug, it would provide strong circumstantial evidence that bacteria initiate PSC. And it would be a good starting point for studies of how the bacteria incite disease. Another possibility, however, is that in PSC vancomycin is acting as more than an antibiotic. Though textbooks label it a bacteria-killer, the Stanford team suspects vancomycin is also changing patients’ inflammatory response. Although the idea might seem strange at first, there’s a well-established precedent for antibiotics quieting inflammation. In the last decade, several groups of researchers have demonstrated that, for example, tetracycline’s anti-inflammatory activity contributes to its effectiveness against rheumatoid arthritis, that macrolide antibiotics reduce inflammation in chronic airway disease, and that amoxicillin lowers bowel inflammation in ulcerative colitis. If vancomycin is acting as an anti-inflammatory in PSC, says Kari Nadeau, MD, PhD, an assistant professor of pediatric immunology and allergy at Stanford, that suggests PSC is a disease of immune function run amok. Scott Seki of Nadeau’s group already has some enlightening preliminary data. Regulatory T cells, the immune cells that prevent autoimmune disease by tamping down the inflammatory response, exhibit interesting changes during vancomycin treatment, he has found. Using blood samples drawn before and after vancomycin therapy, Seki showed that the drug doubles PSC patients’ levels of regulatory T cells. Evidence from other autoimmune diseases suggests this change is big enough to cause therapeutically useful drops in inflammation — in other words, it may explain why vancomycin works. Two other experiments in Nadeau’s lab also pointed to regulatory T cells as key players in the vancomycin response. However, this information is still drawn from observations of a very small group of patients, so the team is now working to expand and strengthen their data. 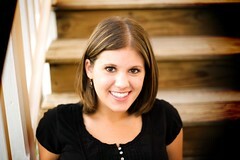 In mid-November 2005, Ellery Woodward-Hartman’s case was presented to the transplant selection committee at Packard Children’s. Though medical records from her pre-vancomycin days clearly pointed toward transplant, the liver-function tests performed after her first 10 days on vancomycin looked promising. The committee decided to re-evaluate her case in December. A few weeks later, after about a month on vancomycin, Ellery and her family saw their physicians again. “Dr. Safta and Dr. Cox couldn’t believe how well she looked,” Woodward recalls. Ellery’s jaundice had cleared up. Her belly, previously swollen with fluids that accumulated when her liver function was at its worst, had returned to a healthy shape. She was still tiny in comparison with her twin but she was more energetic. And by the time the transplant committee reconsidered her case, it was clear that the vancomycin was a success. Ellery didn’t need a liver transplant. Now, after more than five years on vancomycin, Ellery is a thriving 7-year-old. Like other patients taking the drug for PSC, she continues to use it without side effects. Though her liver still bears the scars of cirrhosis, and there’s a possibility she may need a transplant at a future date, her liver-function tests are now normal. Her growth has caught up to her brother’s. “I can’t even calculate what Dr. Cox has been able to do for Ellery,” Woodward says. But there’s one last hurdle: Cox worries that too many patients like Ellery are never offered vancomycin. More than 6,000 people have received liver transplants because of PSC, he says. Though it sounds like a large number, the disease is rare enough that many gastroenterologists never see a case — and so they aren’t reading the literature about new treatment advances. To try to bridge the gap, Cox has partnered with the Children’s PSC Foundation in hopes of helping physicians and patients’ families learn about the treatment. At a recent foundation fundraiser, he got to meet a few children who had received the therapy from other doctors. I’m sitting in a wheelchair in the backseat of an ambulance being driven by an attractive EMT. We’re driving on the highway, under the stars, talking about life, love, roadblocks, choices and pain. He controls my temperature and the car stereo system while he speaks words far more valuable than the gas in his tank or equipment in his trunk. I’m excited yet petrified to be going to the Clinic. Excited because it’s my favorite hospital, excited because my doctors are here, and excited because there’s a chance I will be on the transplant unit, able to see some special familiar faces. Petrified because this is my last chance for answers on my low WBC and platelets. Scared because the next couple days are critical to the rest of my life. I’m finding out – once and for all – if I need a splenectomy or not, if I want to deal with the side effects or even what those side effects may even be. Forget the pneumonia hanging out in my chest… My problems now are much more important than that. Or maybe not – what if the worst – or praise the Lord, best! – is yet to be seen? And thank you for all of the sweet friends who came to see me pretty much all day today. You are all so precious to me. Thanks for all the words of prayer and thoughts of kindness coming at me from so many places. I just wanted to say hi and give you a quick update. A few of you have become concerned at the lack of updates, so I figured I’d write a quick note. And apologize. 🙂 As my previous post (the quote) mentions, the days have been flying by, all together too short! I’m so grateful that my recovery has been a bit miraculous, and a great part of that means I’m back to normal life already. Or at least I was. (More on that later) I’m back nannying full-force and even have a special family for a couple weeks that I’ve really been enjoying being a part of. Plus, the present holiday season and preparing to restart school in January have both been occupying a lot of my time. I got my driving and lifting restrictions lifted earlier than expected, and I was enjoying living a full life until I experienced a setback yesterday. Hopefully, it should be over by next Tuesday, but in a world where doctors are obsessed with legally covering themselves, and healthcare personnel rule their patients’ time and lives, who really knows? I would really appreciate your prayers that this gets worked out and, ultimately, ends as soon as possible. For anyone interested in transplant meds, I’ve been on Prograf since my transplant. I started at 1mg 2x/day, then the doctors later prescribed Cellcept 250mg 2x/day on top of that, as well as raising the Prograf to 2mg 2x/day. I just found out this week that ever since I started the Cellcept, there has been a steady decrease in my weekly labs’ white cell count and platelets. My doctor is having me stop the Cellcept to see what my labs do, as Cellcept can cause both those drops. We’re predicting now that we stopped Cellcept, my levels will rise back to normal. I hope so because Cellcept left me in a constant state of nausea, and I’d love to stop it forever. As a precaution with stopping the Cellcept though, my doctor upped my Prograf again so now it’s at 2.5mg 2x/day. I’m convinced Prograf is what’s causing the weird symptoms that I’ve been noticing since I got out of the hospital… things like losing more hair than normal and even breaking out more than normal. (And normal is pretty much never, so it’s been frustrating!) I think both are slowly getting better, with the exception of my hair being a complete mess – I think the hair I lost when I did the chemoembolization (which was a minimal amount, thank God) is regrowing in now so I have baby hairs that stick straight up in the winter dryness, and the texture overall is just not what it normally is. It’s very frustrating to me. I’m trying to get a post together for Thanksgiving, so until then… be grateful for every breath you take, every moment you live, every person you meet, every place you go. And please, give back and give life. I’m excited to present these newly released statistics because they finally reflects my September 1, 2010 transplant! 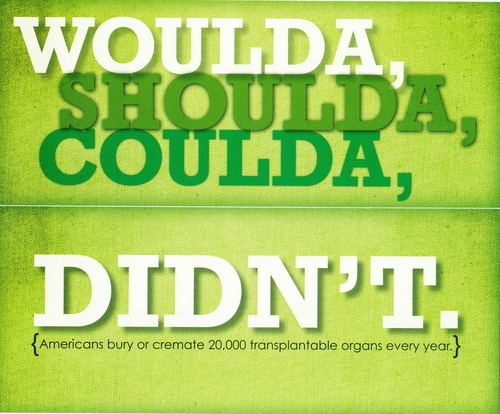 Nationally, there were 109,297 waiting list candidates for any transplant, while there were only 8,477 donors. Because of these donors, 16,778 transplants were able to take place! I might not be here today if it weren’t for my teenage donor who decided to give life at the end of a beautiful summer… right before he suddenly passed away. Please contact me by my information on the sidebar, through any of my social media sites, or you can also contact LifeBanc if you’d like more information about organ donation and how it’s one simple gift that can save 8 lives and change up to 50.